Two people have been killed and 17 injured by a car bomb at a police checkpoint near Derbent in the southern Russian Republic of Dagestan. Islamic State terrorists claimed responsibility in a tweet. FSB says a local terrorist group was used for the job. 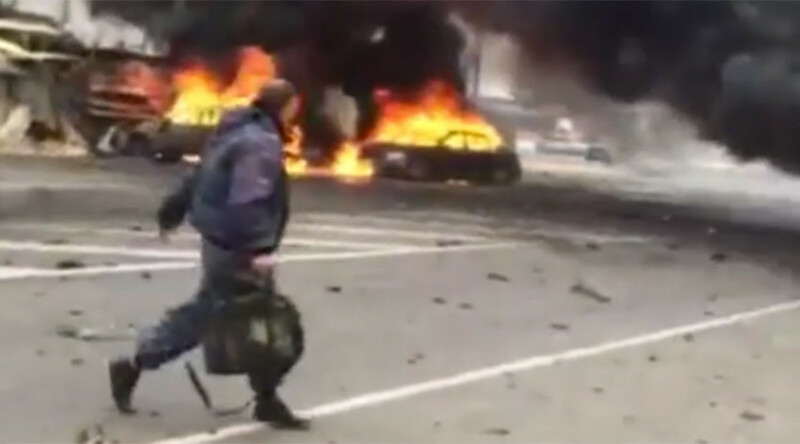 Reports say a Lada Priora approached the checkpoint and the bomb was detonated. It was later determined that a police officer pulled the driver over to check their papers. Witnesses say this is when they heard a powerful blast. Two police officers were killed in the blast and 17 people were injured, including police personnel and civilians, Russian media report, citing the Dagestan Health Ministry. The blast was reportedly so strong it completely incinerated four vehicles parked in the vicinity of the checkpoint. A video posted online shows the scene of the massive explosion, with black smoke billowing from vehicles near the blast, as police get to work. Part of the checkpoint building was destroyed. According to the Russian National Antiterrorist Committee (NAC), the explosion at the police checkpoint in Dagestan was caused by the detonation of an improvised explosive device. The bomb was made up of “two artillery shells with its explosion yield amounting to 30 kilograms in TNT equivalent,” the NAC press service said in a statement. After the incident, security services identified the alleged perpetrator of the terrorist attack and cordoned off the house belonging to his father, entering into negotiations with him, Interfax reports. “The identity of a man who detonated an explosive device near the police checkpoint… in Dagestan has been preliminarily established. He is A. Talibov, 23,” a police source told Interfax, revealing only the last name of the suspect and adding that he was a student at one of the universities in the Russian city of Astrakhan. A former owner of the car which blew up also confirmed to the police that he had recently sold his vehicle to a young man, RIA Novosti reports. The same checkpoint was the scene of an armed assault only the previous night. On that occasion, unknown assailants fired on the checkpoint, wounding one officer, TASS reported. Although IS claimed responsibility, the blame is being placed squarely on a local band of terrorists calling themselves 'Yuzhdag' (short for Southern Dagestan), according to the FSB. The group was founded in 2011 and operates in the aforementioned part of the region. Federal sources say its numbers decreased from 30 to just 10 members in the last two years, thanks to anti-terrorist efforts.